Warming is expected to continue this century, with rates depending on the volume of heat-trapping gases such as carbon dioxide and methane that humans pump into the atmosphere. As the air warms, it will hold more moisture, which likely will mean heavier winter snowstorms and spring rains—with more flooding in vulnerable areas. Yet summers will be hotter and drier. Winter snowfall should decrease in most places, although locales accustomed to "lake-effect" squalls can expect them to dump even more snow—particularly along the Lake Ontario snowbelt in New York. Drinking water quality will be degraded by more releases of untreated sewage during heavy storms and runoff of nutrients that feed harmful algae blooms, some toxic. 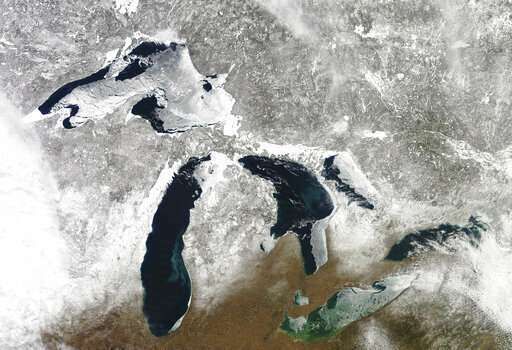 While such blooms are common on Lake Erie and portions of Lakes Huron and Michigan, they've also begun showing up in deep, frigid Lake Superior—an unprecedented development, said Lucinda Johnson of the University of Minnesota at Duluth.